The Dratisi Dragon is a species of dragon thought to have existed over 90 years ago on Dratisi Island. It is said that a small family of dragons, two parents and one baby dragon, migrated from unknown parts and lived on the once deserted island until settlers disturbed their home in the 1920's. The parents fled and the island in fear leaving the baby dragon, by accident, to be either captured or killed by the settlers. The Dratisi Island elder offers a different story. He insists that it was captured and taken away by Subminians, but no one knows for sure. 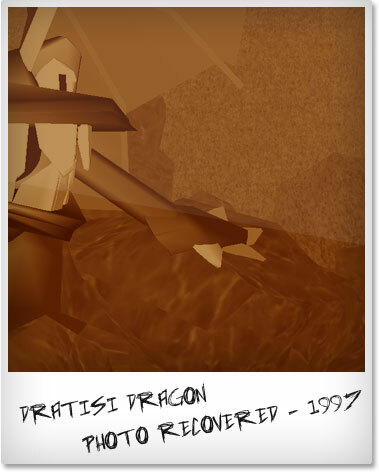 The last remaining dragons are rumoured to have died anywhere from 20 to 50 years ago, until a polaroid picture surfaced in 1997 showing what appears to be a Dratisi Dragon within a cave or rocky outcropping. The picture is from an unknown source and is mostly thought to be an elaborate hoax.